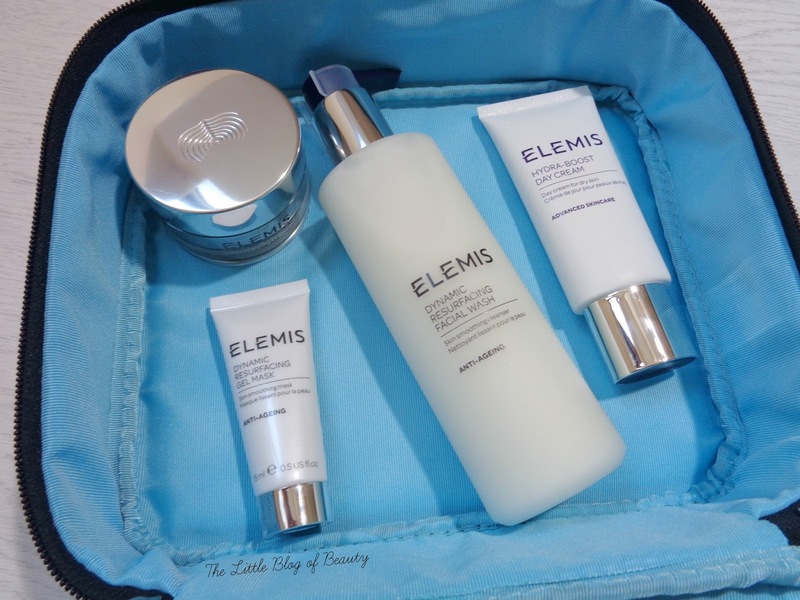 Elemis is a brand that I've only tried a couple of products from but I've been very impressed with the ones I've tried. I currently have a sample of their Papaya Enzyme peel, which I think came free with a magazine at the end of last year, and I'm very tempted to purchase it in full size when I finish the sample. Elemis currently have some amazing value skincare sets available from Debenhams and today I have the Dynamic Resurfacing collection* to show you. I've only had the set for a few days and I've not been using very much on my skin after reacting to a cleanser last week, so I haven't really used any of the products yet, but I wanted to show you the set as they're all only available for a limited time or until stocks run out. I will follow up with a review of each of the products in the future once I've given them a try. 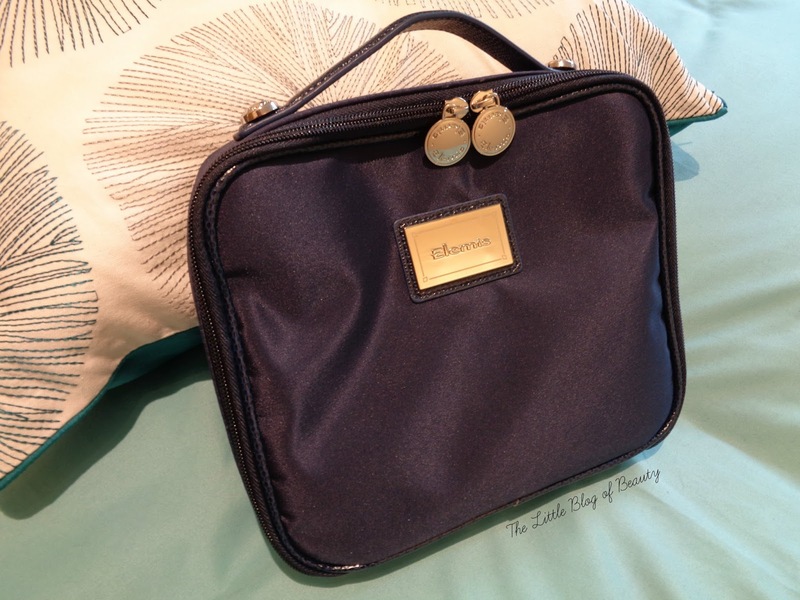 The Dynamic Resurfacing collection contains four products inside an Elemis branded wash bag. I have included a picture of the wash bag below but for some reason I struggled to get a good picture of it so I'm sorry it's a little dodgy. As you may know half the time I live at my boyfriends but I don't actually keep anything at his house so have to pack up any stuff I want to take each time. My current wash bag is getting pretty old so I'll be chucking that out and switching over to this as it's big enough to hold all of my skincare bits. The first product included is the Dynamic Resurfacing facial wash, which is a full size of 200ml and worth £29.50. This was previously called the Tri-Enzyme Resurfacing facial wash but has now been rebranded. This encourages the skins natural cell renewal cycle, smoothing and refining whilst gently exfoliating. I have actually used this product (cautiously) once the rash/eczema had died down after my reaction as I thought it would help rid me of the dry flaky skin it had left me with and it is helping my skin get back to normal. The facial wash can be used twice a day and in the morning you can follow this with the next product the Hydra-Boost day cream, which is a full size of 50ml worth £38. This not a resurfacing product but is a hydrating one for dry skin and contains good old hylauronic acid. For the evening the third product is the Dynamic Resurfacing night cream. I can't actually find this product, it only currently appears to be available as part of their value sets, but as the facial wash has been rebranded this might be the same as the Tri-Enzyme Resurfacing night cream. Although this isn't described as full size it is 30ml, which I think is a pretty good size. I'd describe it as a mini full size rather than sample size! The final product is the Dynamic Resurfacing gel mask, which is a sample size of 15ml worth around £15. This one has also been rebranded from the Tri-Enzyme Resurfacing gel mask. More and more I'm preferring to use masks like this over manual exfoliation, so I'm looking forward to giving this a try. I will be quite careful with this to begin with though as this product apparently comes with a powerful tingling sensation and as my skin has proved recently it really can be quite sensitive! The products in this set are worth £135 but the set is just £54.50, so this really is a bargain as you're saving 60%. As I said though these sets are limited so if you'd like to get your hands on one you need to get yourself over to the Debenhams website (I'm afraid I don't know if these are available in store). 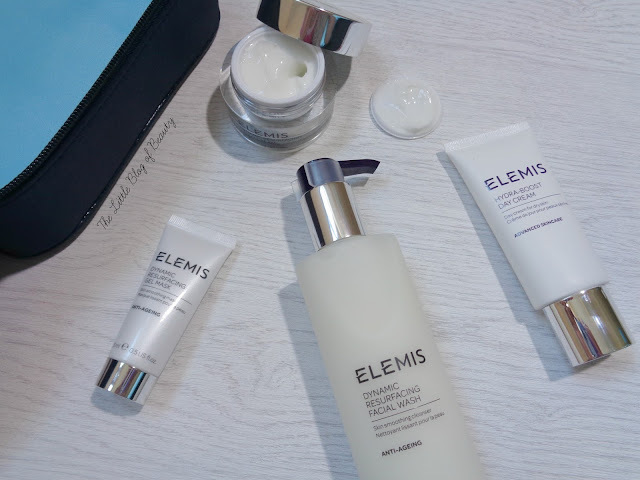 Are you a fan of Elemis? I've never tried Elemis. It seems like such a reliable brand for good skin care. I like the sound of the Dynamic Resurfacing wash. My skin needs some serious change to its surface and it sounds an ideal cleanser for a second cleanse.